As the world eagerly awaits the release of Apple's new flagship iPhone X, developers are anxious that their mobile sites will look good on the device because of the notch. 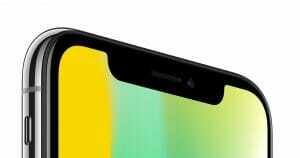 The phone's super-retina OLED screen covers the entire face of the phone, except for the "notch" where the camera and other various components are situated. This results is some awkward situations for screen design, like constraining websites to a "safe area" and having white bars on the edges. contain: The viewport should fully contain the web content. This means position fixed elements will be contained within the safe area on iOS 11.
cover: The web content should fully cover the viewport. This means position fixed elements will be fixed to the viewport, even if that means they will be obscured by the notch. This is the same behavior we had on iOS 10.
auto: The default value, the same as contain. You're probably familiar with CSS variables, but CSS constants? CSS constants can be accessed by the constant() function in CSS, which has been proposed to the CSS Working Group for standardization. Four layout guide constants have been implemented in Safari for iOS 11 to add safe areas for the notch. constant(safe-area-inset-top): The safe area inset amount (in CSS pixels) from the top of the viewport. constant(safe-area-inset-bottom): The safe area inset amount (in CSS pixels) from the bottom of the viewport. constant(safe-area-inset-left): The safe area inset amount (in CSS pixels) from the left of the viewport. constant(safe-area-inset-right): The safe area inset amount (in CSS pixels) from the right of the viewport. Apple’s final gift to us is that these constants have also been backported to UIWebView.